Most people either love it or hate it. We LOVE eggplant, especially fresh from the garden in ratatouille or fried, topped with fresh basil leaves, fresh cherry tomatoes and parmesan cheese. The plants, once established, can be prolific and we inevitably end up with hoards of eggplant by the end of the summer. Our solution is to cut them into 1/2 in rounds, roast them until most of the moisture is removed, cool and pack in freezer bags, layered between waxed paper. Before freezing we always keep some of the roasted pieces in the fridge to microwave with slices of parmesan for a quick, warm sandwich filling or with a salad. Love it! 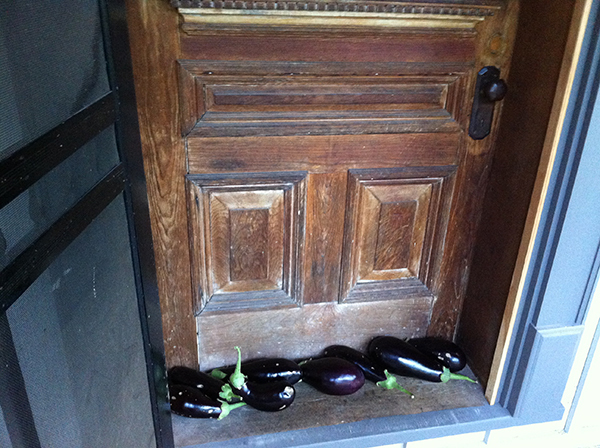 When refrigerator space is limited, we keep the eggplant cool outside the front door until we are ready to roast them. Sliced into 1/2 pieces, roast them at 300º, turning once, until moisture is removed. When they are cool, layer them in waxed paper and freeze. Use later on pizzas, in stews, soups or pasta sauce. Freshly roasted eggplant with melted parmesan makes a perfect side to salad or try it on an open faced sandwich with mayo. Delicious!